Are you spending more on sports drinks now that you are exercising more? How about spending much less and getting more results? You can drink the most effective sports drinks and save money at the same time. Here are the most effective sports drinks that I found at Women’s Health. How nice that they don’t cost much and are often very low in calories! 1. Best drink before exercise: something with caffeine. Not for kids, obviously, but for the rest of us it really helps. I’ve read that it helps us exercise longer because it dulls any pain or strain that we might otherwise feel. Runners are able to run farther after a caffeinated drink. Black coffee and plain tea are cheap and have essentially no calories. Both contain anti-oxidants. Drink either one iced if you don’t want the heat during the summer. No need to add sugar or milk to get the benefits of an energy boost. 2. Best sports drink during exercise: 100% coconut water. The goal here is to replace electrolytes. You can also use Gatorade, but that has a lot of sugar in it. You can make a clone of Gatorade using your favorite sugar substitute (Stevia is good). Click here for the easy recipe for the clone. Compare prices, but I’m thinking the clone is cheaper than coconut water. The clone uses powdered drink mix that usually contains artificial colors and flavors. Coconut water is all natural. You might be able to find an unsweetened drink mix with minimal artificial ingredients, True Lemon maybe (no affiliation). Or make lemonade with lemon juice and your sweetener of choice for the base in the Gatorade clone recipe to be all natural. 3. 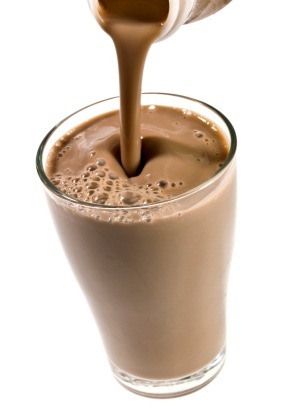 Best drink after a workout: chocolate skim milk. I’d be thinking of this as my goal at the end of my workout! It replaces the energy lost for a quick recovery. And chocolate is good for us! Now you know what to give your kids when they come in from playing or after sports. 4. Best drink for the rest of the day: water. Keep a pitcher of water in your refrigerator for plenty of cold water this summer. It will encourage the whole family to drink the healthiest drink of all. Buy some refillable water bottles to take when out of the house. No need to waste money on bottled water that way and it’s better for the environment. Even when in the house, get the family used to keeping their own water bottle nearby. If each person has a different color it’s easier too. Saves on dishes! Adults are supposed to drink at least 2 liters of water a day to stay hydrated. That does not include other kinds of drinks, so keep that drink bottle filled! Click here for ways to check on the elderly on hot days. Dehydration can be deadly for them, so call your elderly neighbors, friends, and family to be sure they are drinking those 2 liters of water a day. You don’t need to drink water with vitamins in it. Just take your regular vitamins and drink plain water. You’ll save and you can control better which vitamins you get. For extra vitamins just eat vitamin-rich foods like plenty of fresh fruit and vegetables. They are at their peak of flavor now and very affordable as well. Plug the leaks in your food budget by switching to these inexpensive, but effective “sports drinks” and reap the savings all year! Click on any of the labels below this post for more ideas to save money and enjoy healthy inexpensive foods, and wonderful summer drink recipes. femme, how about fruit flavored iced tea with no sugar? I don’t know if they make that kind, but unsweetened iced tea is great! Sorry about the Dr. Pepper. Daisy, I’m with you on not drinking calories. Most of the time, water is IT! However, water does not replace electrolytes lost during exercise. Coconut water and gatorade clones do & are great during exercise. And chocolate milk is actually good for you & gives you a boost after exercise. I stopped drinking fruit juices & am eating whole fruit instead. I have to say I enjoy it so much more plus you get the fiber that is mostly lost during juicing. I’ve always been of the opinion that one shouldn’t drink their calories, but I have heard of the wonders of chocolate milk and coconut water pre and post workout, so I’m intrigued. I’m a big fan of water throughout the day, too.